There are so many false prophets popping up all over America as the business of lying in the name of the Lord has grown into an international business model. I just saw an advertisement for a "Prophecology" Conference at an airport hotel, charging only $600 a head to hear from a gaggle of false prophets including the absurd Juanita Bynum and "Grand Apostle" Bernard Jordan. Putting that aside, today we will be looking at "doctor" Theresa Phillips. To be honest I had never heard of Theresa Phillips until today. I refuse to call her doctor because her doctorate was "earned" from the diploma mill known as "Friends International Christian University." This is of course not an actual university and given their deceptive practices, they are not Christian either. What they specialize in is providing "Doctorate" degrees after completing eight correspondence classes, which the vaguely competent can probably complete in a year. In the real world, a Doctorate typically takes eight years after acquiring Bachelors and Masters Degrees. 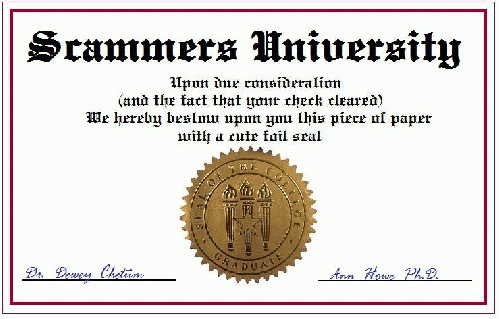 This flim-flam is akin to getting your doctoral credentials from a cereal box. For the record, this is where TD Jakes also received his "Doctorate." "Dr. Theresa Phillips has been given a mandate from the Lord Himself, in a face to face encounter, to take the message of the realm of the Throne Room (the Seat of David) to help strengthen a weakened Body of Christ and to the lost in the streets for such a time as this!" "Dr. Theresa Phillips is the founder of Global Prophetic Voice. She is an ordained apostle under Dr. Renny McLean of Renny McLean Ministries. She has served as Regional Director of Independent Assemblies of God International. She is senior pastor and founder of Kingdom Global Impact Center in St. Charles, Illinois, where she has served for 25 years. She is also an ordained bishop of Kingdom Global Impact Center. Dr. Theresa's gifts include prophecy, signs, wonders, and miracles. Dear Lord, where do we start? She is the founder of Global Prophetic Voice, which is essentially the vehicle for her to "release" her prophecies. She is an "ordained apostle?" Says who? False Apostle Renny McLean? McLean also claims to be an apostle but I could not figure out who told him he was. He also claims to be a doctor, but I could not find out from where he received his doctorate. He is listed as an Adjunct Professor and a School for the Supernatural, where I assume he teaches the gifts of the Spirit, which is biblically impossible. Oh and his wife is also a doctor and a prophetess. Phillips also is also the Regional Director of some outfit known as the Independent Assemblies of God International. Researching them it turns out they are not at all associated with the actual Assemblies of God. Instead, this organization appears to be just part of this network we have been discussing that allows people to pad their resumes and credentials. Their listed hours one can call them are only an hour and a half in the morning and two and half hours in the afternoon. Who can blame them really when you consider their entire organization appears to operate out of a PO Box in Laguna Hills California. It must get hot inside there. As if all of this was not self-serving and disingenuous enough, she starts her own congregation, which meets at a Community Center in St. Charles Illinois. I assume she then named herself senior pastor and at some point she felt she must have progressed enough to ordain herself Bishop! I guess that is only natural when you openly state that you have the gifts of prophecy, signs, wonders and miracles. You just cannot make this stuff up beloved. Or in the case of fake doctor Phillips, you can. Then of course is the absurdly unbiblical foundation fake doctor Phillips claims by asserting that she has a mandate from the Lord, who she met face to face. This is of course not surprising since Phillips ascribes openly to the heresy known as the seven mountains mandate which believes Christians have to take over this world in order to facilitate the second coming of Jesus Christ. The point beloved is look at this nonsense that we are supposed to believe is from God Himself. These words of gibberish Phillips claims is God speaking. Flying battleships with cannons. Prophesying an alliance that has existed for hundreds of years already. Bumper crops of corn and wheat. Paying homage to American veterans and this notion of American exceptionalism. All vanity. This wasn't prophecy. It was an infomercial for Christians who worship this country. Sorry doctor, bishop, regional director, senior pastor Phillips. Whatever you are selling. I ain't buying.